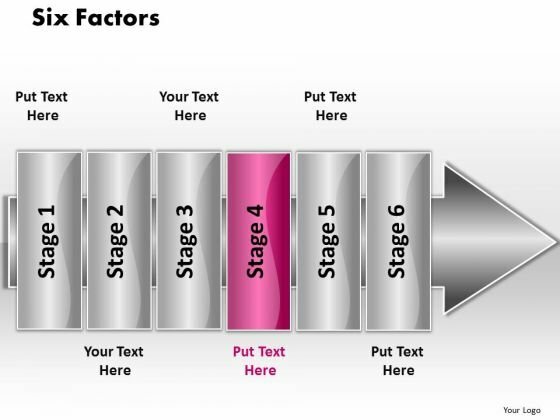 PPT linear flow 6 factors PowerPoint Templates-Visually support your ideas and define your message with our above diagram. This image identifies the concept of stages in process. This attractive image makes your presentations professional and interactive. Deliver amazing presentations to mesmerize your audience.-PPT linear flow 6 factors PowerPoint Templates-6 Factors, Abstract, Arrow, Blank, Business, Chart, Circular, Circulation, Concepts, Conceptual, Design, Diagram, Executive, Icon, Idea, Illustration, Management, Model, Numbers, Organization, Procedure, Process, Progression, Resource, Sequence Our Ppt Linear Flow 6 Factors PowerPoint Templates are high fidelity. They accurately convey your thoughts to your listeners. Convincing others can be an exacting business. Address their doubts with our Ppt Linear Flow 6 Factors PowerPoint Templates.